GRAND RAPIDS, MI â With an immense girth of 43 inches and a massive crown visible from street level three-quarters of a mile away, the ash along the sidewalk in front of 933 Wealthy St. SE is the city’s king of trees. 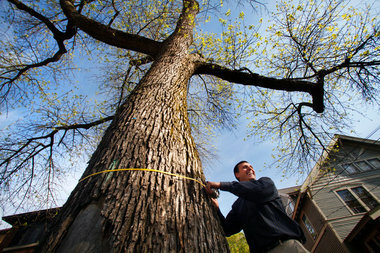 Today, on Arbor Day, Grand Rapids will honor the 55-foot-high ash as the mayor’s inaugural Tree of the Year. “It’s definitely one that sticks out,” said Tyler Stevenson, city forester. But as much for its size, the city’s urban forestry committee will recognize the public street tree for the tiny little plugs around its base. Those are the marks of treatment for the Emerald ash borer, medicine injection points that have enabled the towering tree to keep producing an estimated public value of $223 per year. The ash, the largest of 1,400 street trees the city’s treating for Emerald ash borer, was to be named the mayor’s Tree of the Year at a noon ceremony. The 2013 Tree of the Year will be chosen from public nominations made through a new crowd-sourced tree map, set to launch next month as part of The Urban Forest Project partnership between the city and Friends of Grand Rapids Parks. The project aims to educate the public on the value of trees. For example, Grand Rapids street trees are worth an estimated $71 million and they produce an estimated annual benefit of $6.5 million through retaining stormwater and improving air quality, said Dottie Clune, chairwoman of the city’s forestry committee. The trunk of the ash at 933 Wealthy has a 43-inch diameter, and its crown – an estimated 60 feet across – can be seen from west of Madison Avenue, three-fourths of a mile away. The tree has an estimated value of $9,000 and provides $223 in annual benefit by intercepting 6,949 gallons of stormwater, absorbing 1,393 pounds of carbon dioxide and taking certain pollutants out of the air, according to an i-Tree analysis. The ash, which is estimated to be 60 to 70 years old, has suffered damage: roots along the road were chopped off during street work, and a car likely struck the trunk where there’s now a bare spot. The tree also has gotten help: fertilizing by neighboring property owners, Emerald ash borer treatment and a custom-shaped sidewalk that curves around the trunk.